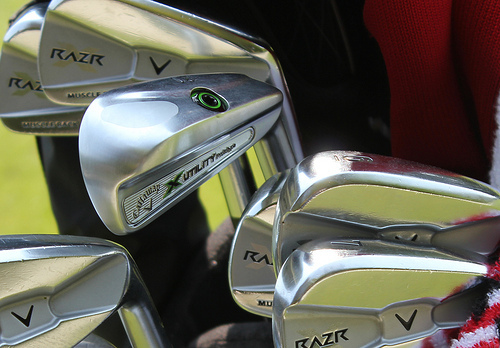 Sports Costs > How Much Does Regripping Golf Clubs Cost? How Much Does Regripping Golf Clubs Cost? Regripping golf clubs is a process done to the handle of the golf club where it is held to ensure that the club maintains its precision and accuracy. When a golf club’s grip ages, it becomes hard and smooth at the same time, causing the golf clubs to lose its original characteristics, making it hard to grip. This job can also be done if you’re looking for a customized look. Experts recommend regripping your clubs every 40 to 50 rounds or once per year. There are different ways to regrip golf clubs, and depending on the procedures and materials used, the price can be different. The price for regripping golf clubs will also depend on the professional performing the job, the type of the club and geographical location. On average, regripping a golf club can range anywhere from $1 to $4 per club, but this won’t include the materials, so be prepared to spend another $4 to $9 per grip, bringing the total to $5 to $13+ per club with the grip. For example, Callaway golf club grips cost about $5 to $7 each. For those who want to do the job themselves, do it yourself kits are available that can range in price from $20 to $30 per set of clubs. For example, the Rexton Men’s Yellow Golf Grip Kit retails for $20 to $30. According to some members on TexAgs, they said the costs could be anywhere from $2 to $3 per club, plus the cost of the grips. During this procedure, the older grips will be removed along with the tape, and once removed, the outside will be wrapped with a double-sided tape that covers the length of the grip. After this, a solvent will be applied so that the grip can be applied to the shaft. When the grip is aligned, it will need to dry for a few hours before it can be used on the course. With the quotes mentioned above, a professional will include all of the materials that will be needed to regrip the golf club will be included and labor. When doing the job yourself, consider purchasing additional materials such as tape and a vice clamp if it’s not included in the kit. These supplies should cost no more than $20. There are companies who provide this service through the mail. Paying to ship your clubs to and from the company will be an extra cost. However, these types of companies usually charge less per club, so the cost may even out. You will know if you need to regrip your clubs when your hand starts to slip or the grips have a lot of wear and tear. Keep in mind that even if you play less than 40 rounds, you could still see quite a bit of wear and tear depending on where you live since the climate can deteriorate them over time. Some retailers will grip your clubs at a discounted rate or even for free if you purchase the grips through their company. For example, golfers have said that Golfsmith will regrip clubs for $1 throughout the year on special days/weekends. Another golfer said Pro Golf will offer similar rates. According to most golfers, it’s extremely easy to re-grip your clubs by either purchasing an at-home kit or even following some YouTube videos online. As mentioned above, it’s best to have your clubs re-gripped at least every 40 to 50 rounds, but if you don’t feel like doing it or you can’t afford it, then make it a habit to clean them regularly with mild soap or a detergent.